Students at DMS are lucky to have many caring and dedicated teachers. However, some students are especially fortunate when they enter the language arts classroom of National Board Certified teacher Tonya Breeding. 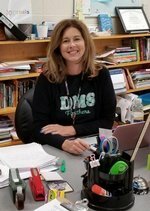 Tonya has been teaching for twenty years and earned her National Board Certification (NBC) in 2011. Her path in education has taken a few twists and turns as she taught history, earned her master’s in counseling and returned to teaching language arts when she joined Madison City Schools in 2001. Tonya says that she continues to learn every day from; in-house professional development, working with other teachers and from the reflection that has become such an important part of her routine as an NBC educator. 1. Read the entire packet as soon as possible. I was in panic mode when I waited until the Christmas holiday. 2. Don’t take more than two years, otherwise you will lose momentum. A year is a very short time, although three years seems too long. 3. When video recording, make sure you record the kids vs focusing on yourself. Set your equipment up to capture their reactions, they are what is important. 4. Don’t be afraid to reflect on the things that didn’t work. Everything doesn’t need to be 100% perfect. It’s ok to reflect on those parts that didn’t work as you expected. Just reflect and share what you learned.